Could you tell the difference between these two iPad Cases? 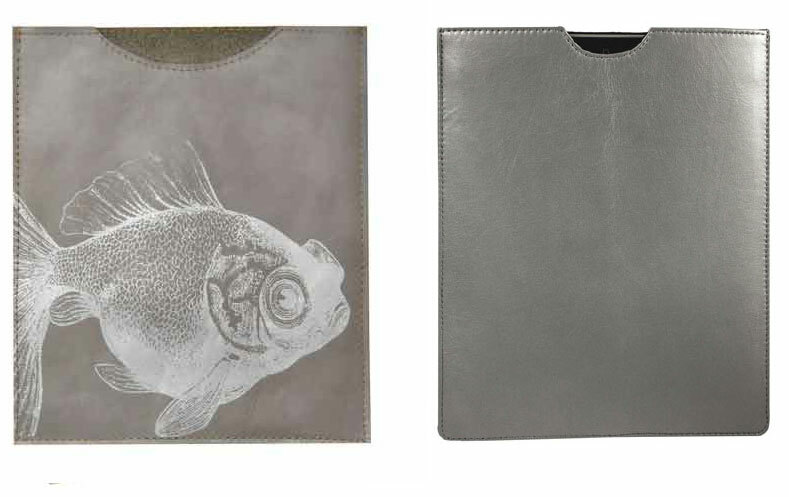 Both are made of high quality Italian leather, both are grey, both would protect an iPad or reader from scratches and smudges, and both have a sleek and polished look and would be suitable for anyone on the move but only one of these is sustainable. Can you guess which one? Okay, maybe the fish design is a dead give away but yes, the one with the screen printed fish on it is the one that is also sustainable. It was created by Dewdrop Designs and comes in a variety of colors and screen printed designs as well as one in a faux snake skin embossed finish. The high quality Italian leather used to create these iPad cases however is upcycled, meaning it comes from remnants of other industries that would be thrown away and end up in landfills if it were not given another use. This leather is then dyed using natural dyes, which once again minimizing it’s environmental impact. Each leather iPad case is hand stitched in the USA, making each one a truly unique find!